Thanks to John Hagan (Ride leader from GTC) for this report. A long weekend and heavy traffic but we did manage to find a few quiter roads at times between the busy ones. Heading out through Armstrong Creek, Lake Rd, Blackrock Rd and the Blackrock Bike Trail were fairly quiet but Blackgate Rd got busier and the Surfcoast Highway was a constant stream of vehicles. Our coffee stop was at Uforic Food Cafe on the Surfcoast Highway – here we stayed indoors to enjoy the warmth and good coffee. Our return trip took us closer to Torquay – along Coombes Rd and the Anglesea Rd and into Geelong on Ghazeepore Rd. The wind had a bit of bite to it today and was a challenge on the way home. 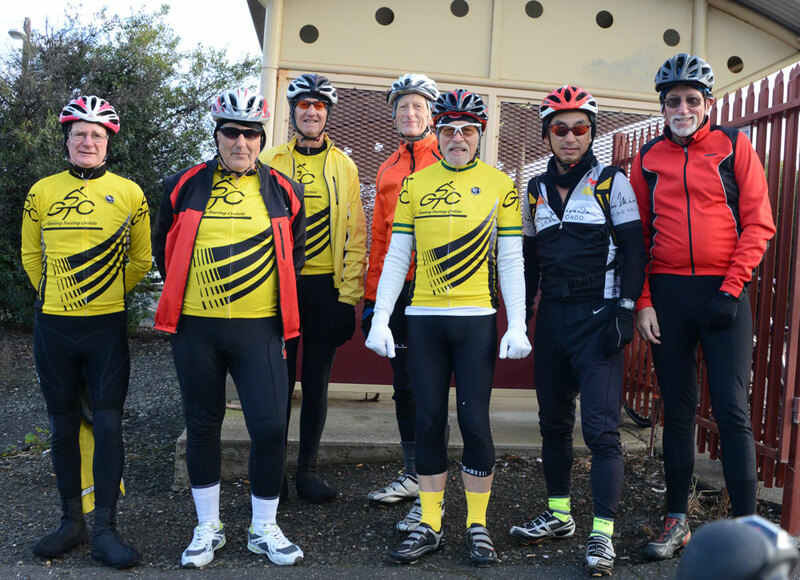 Below are out participants on the ride – from L to R: Chris, Ian, Peter J, Mike, Rolf, John M and your ride leader John Hagan. Thanks to John for the photos also. Editor’s comment: GTC riders proudly sporting the new GTC jerseys. We’d love to see some women wearing them! This entry was posted in Joint rides with GTC, Ride reports and tagged Uforic Food Cafe by hlyth2013. Bookmark the permalink.